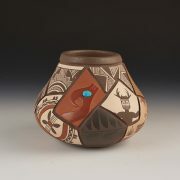 Daryl has carved and painted 21 classic shards on this jar. He has included styles of the Pueblos along the Rio Grande, as well as historic and prehistoric shards. I asked him if he would draw a diagram of each shard so we would know their identity. For this jar, Daryl has drawn a graphic of both sides, and numbered and named each shard. It is included with the piece. Daryl is one of the few potters from San Felipe. He has a unique and recognizable style. He learned to make pottery from his mother, Sara Candelaria. 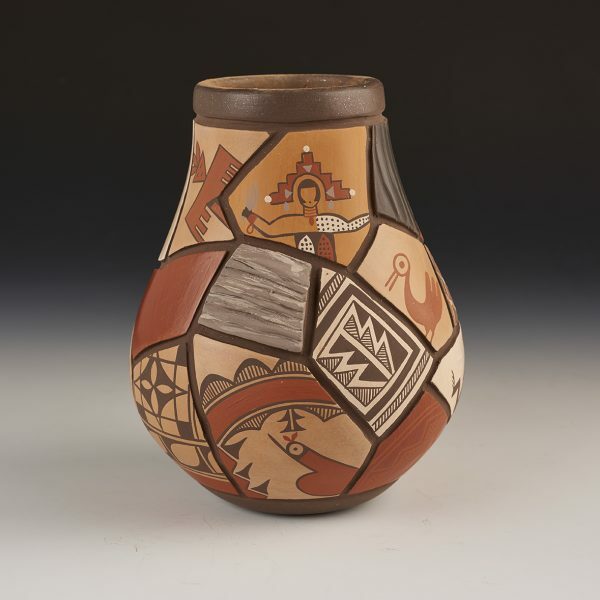 Sara learned to make pottery from her mother, Juanita Toledo (Jemez), who worked with Evelyn Vigil to revive Pecos pottery. His art is pottery shard art, and for this he is uniquely qualified. For several years Daryl worked at the School of American Research in Santa Fe. There, he studied SAR’s collection of contemporary and historic pottery, and their shards from prehistoric pottery. He uses these patterns in his “sampler” style jars. 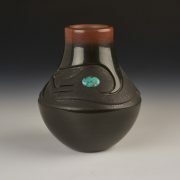 Daryl is an award-winning artist, having won a first in class and a first in division at the 1999 Indian Market, both with a shard jar like the ones in this collection. He also has won firsts at the Eight Northern Pueblos show. 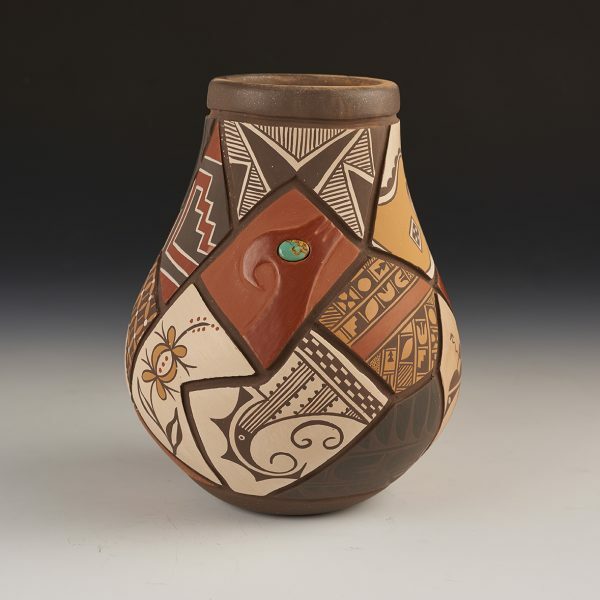 In 2000, he retired from potting, and went to work in the San Felipe tribal government. 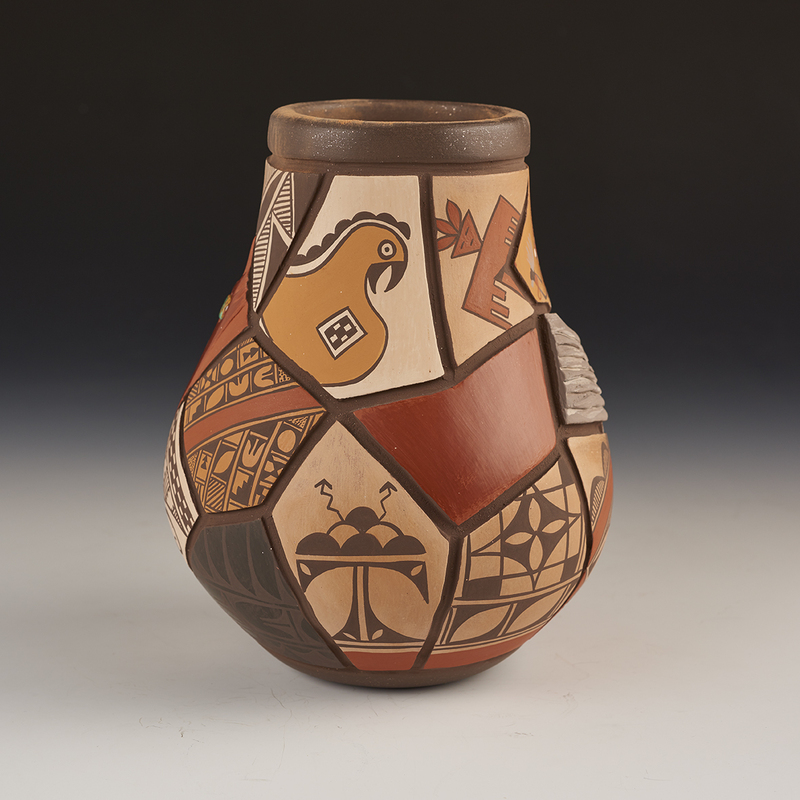 In 2001, Daryl was invited as one of two Pueblo artists to participate in a month-long ceramic exposition hosted in South Korea. In 2007, he returned to making pottery. His style has always been an innovative mix of contemporary and historic motifs, shapes and designs. He is known for this technique in which he depicts numerous pottery designs from other pueblos and cultures on a single pot. Then he deep carves the parts of the pot between the designs and creates the illusion of a single pot made up of miscellaneous shards.